A simple chore is easy enough to get done regularly but the most inconvenient tasks tend to be put off. What could be more inconvenient than dealing with heights, clutter and moss all at once? Amateur roof cleaning practices not only get sub-par results but they are dangerous! When used properly, roof cleaners and tools can extend the life of your roofing but a lack of experience can mean damage. Don’t risk your roof and your wallet when you can call a Gorilla for your professional Moose Jaw roof cleaning and moss removal. Roofs in the Moose Jaw area area designed to protect interiors by keeping the elements out. For every thing that these fixtures are designed to keep out, there is something that refuses to leave. Whether it falls or grows along surfaces, organic material are bad news for your roof. A surface cluttered with leaves, branches, needles or pinecones not only looks terrible but it is a precursor to trouble. These items are known to trap and hold moisture, leading to rot and prolonged damp environments. This degree of rot not only makes for an unpleasant removal but it creates an ideal environment for moss growth. Instead of lending a rustic charm to your home or commercial space, moss eats away at sensitive surfaces around your roofing. There are certain factors that surround properties, creating an ideal environment for moss and algae growth. The types of trees and plant life that surround your space can dictate just how much roof clutter you are dealing with on a daily, weekly or seasonal basis. Shaded spaces are also more prone to invasive plant growth. Something as simple as the slope of your roof can mean a world of difference to your roof moss removal needs. A proper maintenance program can help keep your roof in good condition year-round. Getting rid of clutter is not as easy as pushing material off of your roof. It might be the easiest solution but it is not the most effective. In fact, just sweeping debris from one area to another can clog up other fixtures, such as gutters. 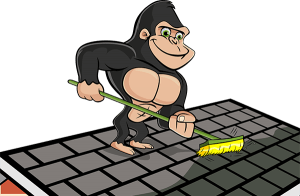 When you choose a Gorilla for your roof cleaning services, we ensure complete removal of debris from your property. While organics can be packed up and carted away, a moss free property is harder to achieve! It isn’t uncommon for property owners to grab hold of items like pressure washers and attempt to blast away moss. As great of an idea as this might sound, it can cause damage to asphalt roofs. In fact, many asphalt roof manufacturers advise against these types of cleaning practices. Choosing a local roof cleaning company like Gorilla means learning about our process and your problem areas. Taking tools like wire brushes to softened materials wears away protective coatings and can even put holes into roof decking. Our specialists inspect the condition of your roof before laying a paw on it. With proper safety techniques, a trained eye and specialized tools, you can expect great results every time. Instead of leaving our customers in the dark, each and every Gorilla carries a smart phone to provide clients with photos. Before and After photos are just part of our customer service routine!